In the early 1990s, I was a young researcher for Human Rights Watch when a Jesuit priest came to see me in New York. Harry Miller, S.J., was on his way to New Orleans, his birthplace and the headquarters of his mission, and he wanted to speak with me about conditions in the eastern Sri Lankan town of Batticaloa, where he had lived for decades. The situation was dreadful, he said, and the world needed to know what was happening. Batticaloa had been a sleepy little coastal town in 1948 when Father Miller volunteered for the Sri Lanka mission for his Jesuit regency. He taught school and coached soccer and eventually learned enough of the Tamil language to say a simple Mass once he was ordained. He served as the rector of St. Michael’s College, an all-boys preparatory school, for more than 20 years. In 1983, the country descended into a bitter and prolonged ethnic conflict. Eastern Sri Lanka, with its multi-ethnic population, became hotly disputed territory. Father Miller, then almost 60, was thrust into a new role as witness, advocate, intermediary and protector not only for his students but for anyone in Batticaloa who sought his help. He had a privileged position in the community as an older, foreign-born priest, and he used it. Father Miller was a witness, advocate, intermediary and protector not only for his students but for anyone in Batticaloa who sought his help. By the time I met Father Miller, he had lived that role for nearly a decade. The people of Batticaloa were trapped between Sri Lanka’s security forces and the Liberation Tigers of Tamil Eelam, known as the Tamil Tigers, a powerful rebel group that sought a separate, ethnically defined Tamil state in Sri Lanka’s north and east. Schoolchildren were being forcibly conscripted by the rebels right out of their classrooms and out of the arms of their parents. The Sri Lankan army and police killed and disappeared Tamil youth with impunity in their effort to root out the Tigers. Unidentified bodies burned in the streets. The Tamil Tigers massacred Sinhalese (Sri Lanka’s majority ethnic group) and Muslims in areas they sought to dominate; the Sri Lankan security forces and local “home guards” retaliated against neighboring Tamil villages. Thousands of civilians were displaced by the conflict. Family members trudged from one armed camp to another searching for missing relatives. Mothers faced down men wielding automatic weapons. Father Miller and his longtime friend and colleague Eugene Hebert, S.J., also from Louisiana, took extraordinary measures to protect their students and other community members from danger. They hid them from Tiger recruitment drives, intervened when people were arrested or abducted, mediated communal disputes and openly criticized parties to the conflict.Then, on Aug. 15, 1990, Father Hebert himself disappeared, along with a young Tamil man named Bertram Francis. According to Father Miller, the two had been seen riding a scooter through an area where tensions were high following a rebel massacre of Muslim civilians. A Red Cross nurse waved to them as they passed by on the road. Father Miller was formidable when he had to be, especially in a cassock. Their fate is still unknown. Maybe, Father Miller speculated at the time, they were killed by the army or, he heard later, by angry Muslim villagers. Had Father Hebert stepped in to stop looting or protect Bertram? The authorities, as was common, blamed the Tigers for the disappearance and did little to investigate. Father Miller searched for the two men, even reportedly checking abandoned wells where bodies of those who disappeared were sometimes hidden. But they were never found. Father Hebert’s disappearance seemed to harden Father Miller’s resolve to use his position as a priest to combat the abuses in his adopted home. His superiors must have been concerned about his safety—the trip to New Orleans, I gathered, had not been entirely Father Miller’s idea. He was so hungry for news of Sri Lanka during this trip he called me in New York just so I could read him the headlines. Father Miller was formidable when he had to be, especially in a cassock. But even in civvies, relaxing in his cane planter’s chair on the breezy upstairs veranda at St. Michael’s College, he had an intensity that demanded that you pay close attention because he did, too. Sri Lankan activists will take up where Father Miller left off. He made that possible. Under his leadership, a small group of locals known as the Batticaloa Peace Committee documented some 8,000 complaints made by family members concerning relatives who went missing during Sri Lanka’s protracted armed conflict. It was a frustrating endeavor. The first records were handwritten onto notecards. There were inevitable duplicates and plenty of unknowns; a later attempt to digitize these files was overtaken by advances in technology. During one of my visits, Father Miller gestured to a dusty computer and complained that the program he had used to record data on disappearances was obsolete. He wondered aloud what could be done. Eventually the information was collected in a usable format, but even when Father Miller was finally able to present the cases to the Sri Lankan authorities, very little came of the effort. Reaching truth and justice for enforced disappearances in Sri Lanka remains a work in progress. Most families who went to the Peace Committee are still waiting for answers. In 2009, the war in Sri Lanka ended after a devastating loss of life and alleged war crimes on both sides. The political environment was repressive, and official tolerance of dissent was at an all-time low. Father Miller agreed to a sabbatical at Ignatius Residence in New Orleans. Everyone thought that surely, this time, he had left Sri Lanka for good. They even gave away the belongings he had left behind. But it didn’t stick. 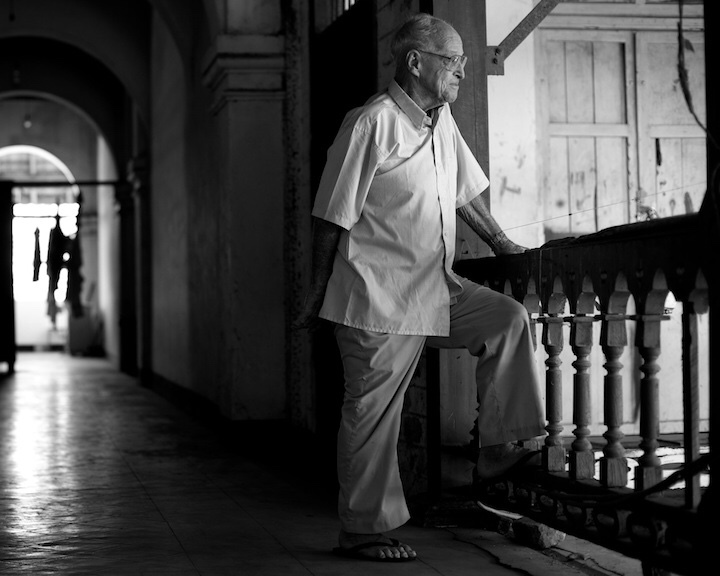 I last saw Father Miller in March 2016 in his habitual place, the veranda outside his room at St. Michael’s where he read his morning newspapers, welcomed visitors and watched life at the college go by. He was 90 years old and, hard as it was to believe, finally seemed to be slowing down. Father Miller died in Batticaloa on Jan. 1, 2019, at the age of 93. His work was not finished. The need to account for the past in Sri Lanka is as pressing as ever. It is the only way to ensure that the crimes committed against Sri Lanka’s people are not repeated. But Sri Lankan activists will take up where Father Miller left off. He made that possible. May God bless Father Miller. Thanks for the article; I have added the Sri Lankans to my prayers. Inspiring story of a great man in a place that needed him. Pray for Sri Lanka, and that Ang San Su Kii (sp?) returns to the rights warrior she once was. Thank you America and particularly Jeannine Guthrie for this thoughtful and important reflection on Fr. Miller's life and ministry to the people of Sri Lanka. Having worked with people and programs during the 90's to address humanitarian needs of communities torn apart by the Tamil Tiger/gov't conflict - your account is searingly real. I wish I'd known of Fr. Miller's work back then - and his perseverance into the 2000's. May he Rest in Peace and his work continue in the efforts of many others. P.S. It would be helpful to offer links to more information on this issue for those who are interested...many thanks again. Eternal rest grant unto him O Lord and let your perpetual light shine upon Fr Harry Miller, S.J. Jeannine Guthrie is an independent human rights researcher and advocate who has followed events in Sri Lanka for almost 30 years. She has worked for Human Rights Watch, Amnesty International and the Asia Foundation in Colombo.